Located in historic Camden, South Carolina's oldest inland city, the Camden Country Club offers the best in southern hospitality and the finest facilities for golf, tennis, swimming, banquets and meetings. Chartered in 1899 as a place "for golf, polo and other athletic sports" and established in 1903, Camden Country Club is considered one of South Carolinas distinguished private clubs. Camden Country Club golf course was re-designed in the late 1920's by the renowned golf course designer/architect, Donald Ross. The 18 hole championship course is one of the Carolinas most challenging tests of golfing skills. 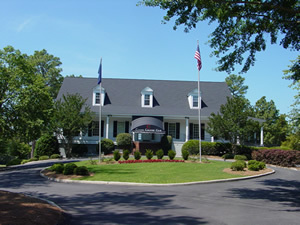 Camden Country Club golf course has been home to the Carolinas Golf Association Men's 4-Ball Tournament for more than 50 years. We have hosted the qualifying for the USGA Men's Amateur and Mid-Amateur Tournaments and the CGA & SCGA have held numerous events here at Camden Country Club. The par 70 golf is a challenging 6,350 yards from the "tips," and is always rated in the top 25 of South Carolina golf courses. Please browse our website for details on the various amenities and the memberships we offer.